Inserting a nasogastric (NG) tube in a crying infant or frightened and struggling child can challenge the skills and patience of any healthcare professional. Although you may want to complete the procedure as quickly as possible, your task isn’t finished until you have verified that the tube has been correctly placed into the stomach and not the esophagus, small bowel, or lung. While an x-ray is the most reliable method of assessing NG misplacement which might lead to injury or death, it may be impractical in some settings and introduces the risk of potentially harmful radiation overexposure for pediatric patients, particularly neonates, whose tube may be removed several times a day. The NOVEL Project (New Opportunities for Verification of Enteral Tube Location) was formed to identify the best existing verification practices and to encourage the eventual development of new verification technology. 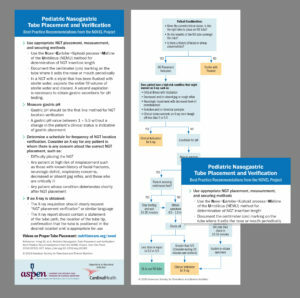 Spearheaded by ASPEN (American Society for Parenteral and Enteral Nutrition), the NOVEL Project’s comprehensive review of existing procedures and outcomes has enabled us to determine the best practices for NG tube insertion, and to also recommend the use of gastric pH measurement as the first line method for verifying NG tube location. The following brief overview of NOVEL’s life-saving recommendations can be followed quickly and easily in any setting—from a PICU to the home. They require minimal equipment and the verification results are available within minutes. To determine the insertion length of the NG tube, measure from the Nose, to the Earlobe, to the Xiphoid process, to the Midline of the Umbilicus (NEMU). Be sure to note the centimeter marking on the tube where it exits the nose or mouth and periodically check and document that its location has not changed. Measure the pH of gastric secretions. A gastric pH value between 1 – 5.5 without a change in the patient’s clinical status indicates gastric placement. NOVEL is actively working with the Patient Safety Movement Foundation and other organizations to encourage hospitals to adopt these best practices and to educate healthcare practitioners at all levels in their application. ASPEN also offers two instructional videos on Pediatric Nasogastric Tube Placement and Verification. One video is geared for Professionals and the other for Caregivers. The videos will also be available in Spanish after January 18, 2019. These 18- to 20-minute instructional videos not only demonstrate the recommended procedures for insertion and verification on a model and a live crying infant, but they also include practical tips learned over years of placing NG tubes in pediatric patients. The videos, as well as additional information and publications from and about the NOVEL Project, are available at www.nutritioncare.org/NOVEL. The NOVEL Project will meet on March 23 during the ASPEN 2019 Nutrition Science & Practice Conference in Phoenix, AZ. Interested clinicians and industry members are welcome to attend. The reference cards will also be distributed at the meeting. Practitioners can learn more about enteral access management and clinical nutritional therapy during the ASPEN conference which continues through March 26. Many other conference sessions focus on patient safety, including organizational practices and legal concerns, competency training, and disaster preparedness. The tragic stories of a young life being cut short by a simple procedure intended to nourish and prolong that life are all too familiar. No one—not the family members or the healthcare professionals involved—will ever be the same again. We can reduce—and hopefully one day eliminate—preventable deaths from NG tube misplacement. We have the knowledge and the tools at hand. It is up to us to apply them.